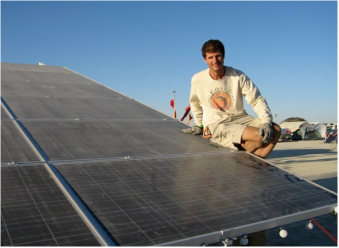 For 13 years SKS has provided solar power for artist project, camps, villages, and individual Burners. Each day our camp hosts a snow cone cocktail party during the late afternoon. We have a dome with seating, a sound system and proper snow cone-making technology. Part of your camp fee goes to procuring a wide assortment of syrups, alcoholic additives, cups and ice. These cocktail parties are a great way to meet other Burners and have fun with fellow camp members. There is the ritual of procuring the ice, prepping the dome, making and serving the cones and clean-up afterwards. For people new to the camp or to Burning Man, it’s a great way to jump in get involved with zero preparation before your arrival on the playa.